You know those folksy little credits on the back of Popular Penguins? The early chapters of the book don’t do much to make me like these brothers. While I felt some pity for Richard (the middle one and hero of this biography) when he was exploited as one of the Barwell Boys in South Australia’s immigration scheme for agricultural labourers, the stories of their adolescent partying and carousing in London didn’t interest me at all. Born into comparative privilege, they became even more privileged through inheritance, and promptly gratified their taste for what Kells calls ‘mischief’ and I call loutish behaviour. This example follows on from their routine strategy for not paying the gas meter in the digs they shared, to which a new landlord took exception. When Pritchard died, O’Grady bought the practice and cracked down on the tenants, with whom he had grudgingly shared the sitting room and bathroom, and for whom he had developed a needling dislike. When he took over the building, one of his first acts was to padlock the bathroom’s meter box. Rising to the challenge, Richard fossicked through his collection of old keys and found one that fitted, ‘so we reverted to the one-penny system’. Relations with O’Grady quickly deteriorated and the Lanes decided to leave with a bang. World War II sobered younger brothers Richard and John, while it’s hard to escape the conclusion that Allen – the villain of the story – was a greedy shirker. Not only did he not serve, he also tried to set up a black market arrangement to sidestep rationing quotas for printing paper. This was especially shabby because Penguin had been allocated more paper than any other publisher because it was allocated on the basis of sales in the previous year, and 1938-9 had been the year of the bestselling Penguin Specials. But this pales into insignificance when compared with Allen’s cruel remark on hearing that John had been lost with all 800 other men aboard HMS Avenger, that the wrong brother had been killed in the war. Things go from bad to worse, as Allen outmanoeuvred Richard at every turn, finally acquiring complete control of the business, and reneging on succession and financial agreements. Richard was sidelined to Penguin Australia, but made a new life here for himself and his family, apparently resigned to his brother’s perfidy. 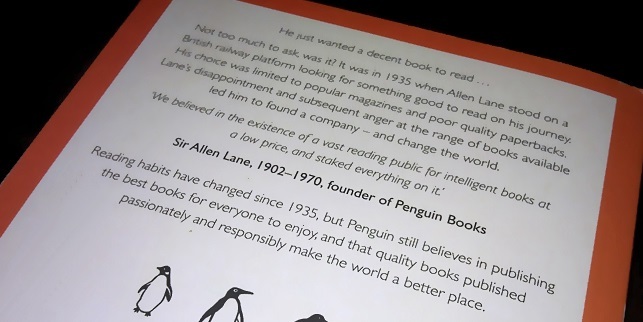 For Penguin aficionados, and people interested in the history of books and publishing, Penguin and the Lane Brothers will probably make for enjoyable reading. Stuart Kells has an engaging style, and the frequent inclusion of anecdotes, diary entries and letters, liven up the corporate history that might otherwise be rather dull. But while I think there’s a place for this sort of ‘set-the-record-straight’ story, I found the book unedifying. I didn’t enjoy reading about Allen’s rotten behaviour, but it was in the chapter entitled ‘In Armour’ that I realised the reason for my distaste. During the war, in 1942, Penguin negotiated with the military brass to start a Forces Book Club, providing cheap quality paperbacks for men and women in the services, people like my father in the army and my mother in the ATS. My father still has some of these books on his shelves, and while this marketing coup was very profitable for Penguin, its lasting effect was a conditioning of a whole generation to a sense of gratitude for Penguins, to a degree of autobiographical identification with the Penguin achievement. Review copy courtesy of Black Inc. I agree. I have always thought that Penguins were a bit special. I’d never heard of the verb to fossick. I thought of you as I read this! And I wondered what you think of the brouhaha over cover image v plain-and-simple design? I must admit that I associate the Penguins with photos on the front cover with a decline in standards. Until then I would zero in on any Penguins at the OpShop, feeling confident that anything I bought would be good to read. But IMO there were duds in the Australian fiction lists back then when the photo covers arrived.